We captured this candid moment of the bride and groom just before their ceremony on the serene and luxurious Little Palm Island, just off the coast of Marathon, Florida. 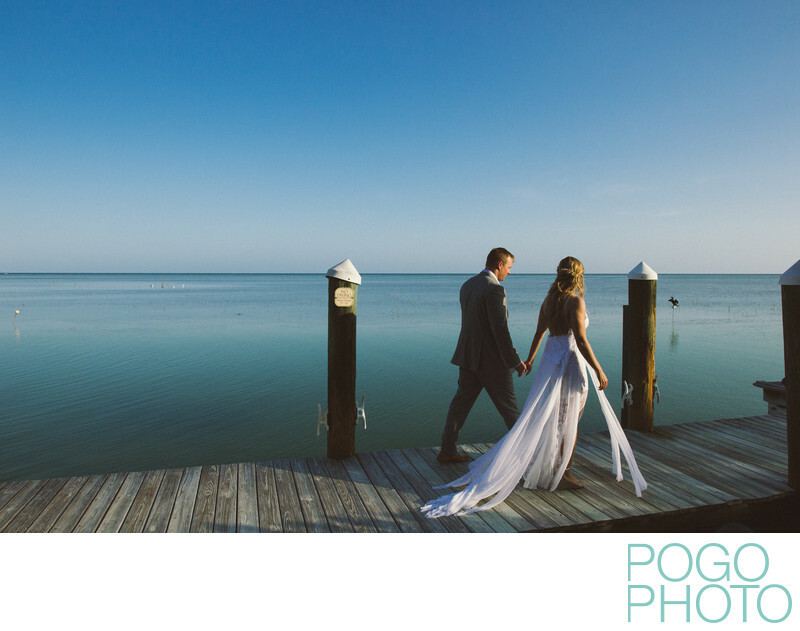 As Little Palm Island wedding photographers, we enjoy the amazing opportunity to be a part of some of the most incredible, tranquil, and beautiful weddings imaginable anywhere in the Florida Keys. This wedding destination is known around the world for its hospitality, unique location, and stunning views. The Florida Keys have a charm all their own, and nearly everything synonymous with the string of islands in on full display on this private island resort, restaurant, and event venue. Wandering around the tiny island offers more photographic opportunities than most other venues afford, which is ideal for photographers like us. The world-class restaurant on the northern end of the island can be magically transformed into a reception space in a matter of hours, harmoniously blending into its background of beaches, clear skies, and ocean stretching unobstructed to the horizon. Perfect as an elopement destination, an engagement session location, or a wedding venue, Little Palm Island is the ideal spot to host a union in the Florida Keys. We like to spend the first part of any wedding day on Little Palm Island strolling around the property with our cameras, documenting the feel of the island, as it is like no other. Paths and boardwalks stretch around the entirety of the island, allowing us as photographers to use natural light from any direction we choose. Even under the midday sun, a canopy of trees in the center of the island provides a respite from sun, which is often blazing due to the perfectly clear skies that occur frequently here. Every type of weather and cloud cover create different opportunities to play with the light in photos, but at a place like Little Palm Island, a quick change in the sky can be countered immediately with a change of location. When a beam of sun opens up from between the clouds and races across the open ocean, we can quickly scurry to an area where we might be able to use it, if only for a second. Then when the angle of the light changes in the late afternoon and evening, the two of us can photograph a scene from two angles and simultaneously produce two completely different images by using the natural light in a variety of ways. In terms of using the light to our advantage, the best example is sunset. During golden hour, the sun is close enough to the horizon that the atmosphere bends the light into an assortment of colors. Nearby Key West likes to claim that it is the “home of the sunset” but we prefer the view from here with 5,000 fewer tourists, 5-star dining, and a gentle breeze off the water that never seems to stop. That breeze is not a hallucination; the exact location of Little Palm Island means the wind blows more consistently and the temperature is always just a few degrees cooler than the main islands just three miles away. The island sits three miles southeast of the Overseas Highway and has long been known for its position directly in the path of the trade winds blowing out of the southeast. It’s easy to forget about the weather while you’re focused on your wedding, but every once in a while there is enough of a break in the action that you can’t help but be entranced by the serenity surrounding you. Little Palm Island Resort and Spa is the name of the hotel operating on the tiny strip of land known as Munson Island, which has a history all its own. The Florida Keys were first surveyed in the late 1840s, but the island did not receive its name until 1923 when it was purchased by Charles Newton Munson. It would later be used as a retreat for multiple recognizable personalities including George Wallace, John Foster Dulles, and most famously President Harry Truman. After changing hands a few times and surviving a massive hurricane, the island gained notoriety as a filming location for PT-109 in 1962. John Spottswood, who owned the island at the time, is actually in the movie, playing the role of skipper of the PT-109 itself. The resort you can visit today was opened in 1988 as the Little Palm Island Beach Club, but major renovation just before the new millennium enhanced the property and elevated it to its current state. The layout of the resort creates a cohesive feel throughout this tropical paradise. Accessible only by watercraft or seaplane, the island is encircled with a boardwalk and intermittent docking posts. When taking the resort’s wooden transport boat to the island, guests dock at the long pier which serves as the entrance point for both the restaurant and the hotel. The approaches builds anticipation as the boat leaves its slip on Little Torch Key, meanders past some residences, then turns toward the open ocean. Little Palm is visible in the distance for nearly fifteen minutes, growing larger on the horizon until the boat finally arrives at the dock. After disembarking, the long wooden walkway provides for panoramic views of the islands and surrounding water, complete with umbrella protected benches along the way. The walkways leads onto a small patio, often where the band sets up during a wedding’s cocktail hour. From there, the interior and exterior portions of the restaurant are immediately accessible, both offering spectacular views of the ocean as it laps at the sandy beach just a few feet away. We knew we would like the restaurant when we saw our favorite bourbon on the shelf, a rare batch barreled in Utah, of all places. The food and service exceeded our expectations, helping elevate the entire resort’s status in our minds from that point forward. Visiting Little Palm Island for lunch or dinner limits you to just the western tip of the island, but guests staying on the island may roam freely around all nine acres of the property. There is not a large, freestanding hotel on the island, but rather thirty individual bungalows scattered around the perimeter, each feeling completely separate from the others thanks to precise, yet still natural-feeling landscaping. Private decks, fire pits, and lounging areas surround the cabins while the interiors feature modern amenities and windows on nearly all sides. Sandy paths connect the cabins to all the island has to offer, including canoeing, kayaking, boating, or relaxing by the newly remodeled pool area. After venturing out on the water, watching the sun set, and enjoying a multi-course meal, guests return to their rooms discover that the staff have already lit the fire pits in each courtyard. The flames provide the primary light source on the island, making it a stunning sight to see from across the water or while on the transit boat. We get to visit the island, but a group of Key deer have the honor of calling it home. Little Palm Island is known for its Key deer and they seem to make it into a majority of photos taken onsite. The deer only live in a small section of the lower Florida Keys, but swim between islands to chase pools of fresh water. Key deer are known for their exceptionally small size, small population, and their propensity for human interaction. Amazingly, key deer were hunted as a food supply for the native people in the area and killing them was not outlawed until 1939. Just sixteen years later, the total number of Key deers in existence has dropped to an estimated 25 individuals. This endangered species has somewhat recovered in recent years, but the population is still below 1,000 in total. Brides getting married on Little Palm Island will find out quickly that Key deer enjoy eating mangroves, berries, and flowers out of bouquets. For the select few that can buy out the entirety of Little Palm Island, hosting a private event will provide an exceptional experience that will be forever remembered by those in attendance. While this is an incredible option, we also encourage the more common and scaled-down island elopements. We repeatedly remind our clients that their wedding is entirely for them, and that friends and family get to participate in whatever way the couple decides. That decision may be to host a lavish affair for a few hundred friends, a small get together for those closest to the couple, or a private ceremony without any guests at all. We have seen extended elopements recently evolve into a “weddingmoon,” where brides and grooms forego the formalities of a wedding and get married during a very special vacation with their photographers in tow. If the idea of a tropical paradise appeals to you and you’re thinking about eloping, we’re ready to be by your side all day (or all week, if you want to document your entire adventure). 1/2500; f/8.0; ISO 1000; 24.0 mm.